2011 has been a busy year for mobile banking with the tremendous growth of smartphone penetration and the increasing consumer interest for tablets. In the last twelve months, we saw litteraly dozens and dozens of new mobile banking and mobile payment apps (mainly on iphone, ipad, android). But most apps only offer basic features. Few are transactional. Fewer are innovative. There was a few exceptions with the likes of Citi’s ipad app or the Standard Chartered Breeze offering including an innovative wishlist service ‘a la Smartypig’. In this post, I won’t insist too much on crowdsourcing, but if you are interested I invite you to read my coverage of two initiatives from European banks focused on Apple’s almighty iPad: Danske Bank’s Ideabank on facebook and Webank’s wepad project whose delivery was somewhat underwhelming. Yesterday I received an email from Jean-Marc Ouvre, Community Manager at Societe Generale and one of the contributors on Societe Generale’s twitter account dedicated to customer support and customer engagement@SG_etvous which we currently rank at #17 in France in our Visible Banking Twitter Watch series (we are now tracking over 1,650 accounts in 73 countries). I invite you to watch my video interview with Jean-Marc and Julien Grandetabout the bank’s twitter strategy. In his email, Jean-Marc informed my of today’s official launch of L'”Appli Societe Generale for iPad“, an application developed, hence fully optimized, for the ipad. I invite you to watch the video in English (please note there is also a French version). On the video, Societe Generale announces that its ipad application offers “a gorgeous user interface, easy to use, customizable, and just works like a banking app on an ipad should work”. This somewhat cheeky statement unarguably refers to BNP Paribas’ hurry to claim the launch of the 1st mobile banking application for ipad in France (even though the app back then wasn’t leveraging neither the native features of the ipad nor half of its full potential). It is a big step up from the bank’s previous ipad applications like SG Research or RE-VIEW. In November 2011, Societe Generale received a Communication via Tablet Award for their digital magazine for iPad, RE-VIEW, launched by the French bank back in January 2011. The application delivers some dedicated content: a daily financial press review, monthly economic sector analyses, the latest Group news and Societe Generale’s share price. Users will also have access to the bank’s quarterly thematic dossiers. Last but not least, on 3rd January Societe Generale proudly announced on their blog that they collected over 18,000 customer feedback, reviews or suggestions. This ‘Voice of the Customer’ initiative (VOC is one of my favourite topics) ran between April and December 2011 in SocGen’s largest branches throughout France. The relevance of this initiative within this article? The HOW: they rolled out some interactive stands incorporating ipads. Even though you could point out that customer feedback is valuable if and only if it is left in an authenticated environment, and I would be curious to find out how few customers left their email address to be contacted back, this is still a good initiative. For at least three-and-a-half reasons: 1. it could easily be replicated in the future, 2. it is a good learning exercice for the bank, 3. it is a cost effective way to refresh the brand and be perceived as more innovative, and… the bank might even identify a few actionable good ideas! Of course, we are far from the potentially significant value of online innovation labs like the first direct Lab or Commonwealth Bank of Australia’s Ideabank. Please note that to maximize the volume of activity and especially to be able to launch those initiatives, you don’t have to authenticate yourself to contribute. So, it looks like Societe Generale believes in the ipad and is prepared to invest resources and budget to develop customized and engaging applications. Would you agree with me? 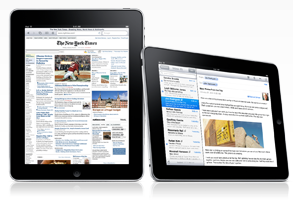 And according to you, from all over the world, which bank is the most committed to the ipad?